We have recently added a new branding and interior design project to our (already hefty) portfolio. 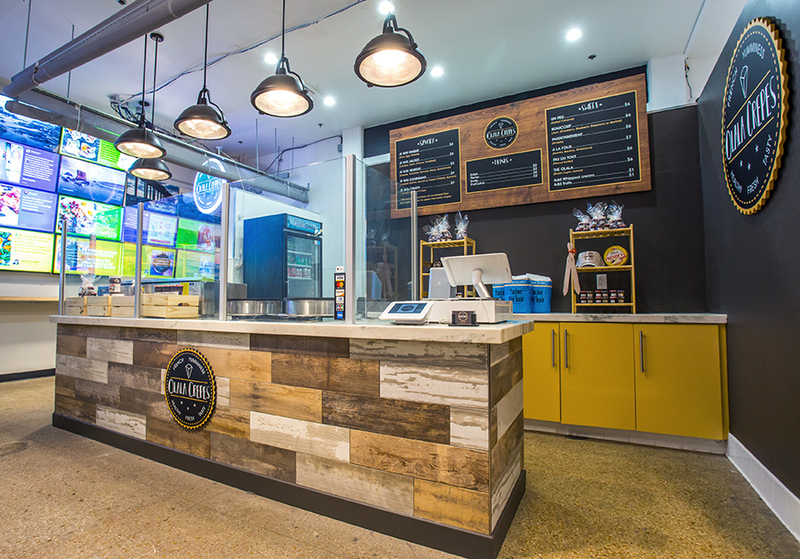 This time, it is the Olala Crepes kiosk in the heart of San Diego Liberty Public Market. 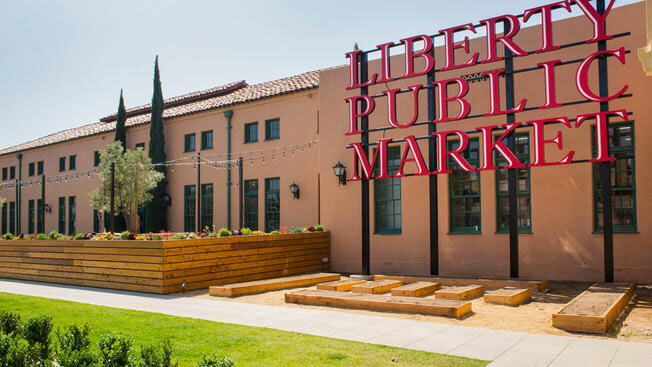 A cool concept – and an even cooler place to hang out – the Liberty Public Market is a massive food hall that leaves few tastes unsatisfied. With an inviting dining deck and a large outdoor space, this market offers both ample food choices and opportunities to relax. 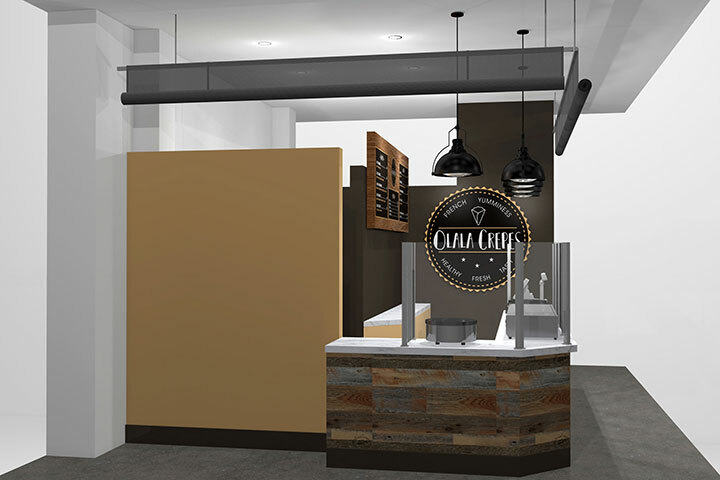 Located within the market, Olala Crepes kiosk aligns itself with the feel of the place, but adds to it its own character. 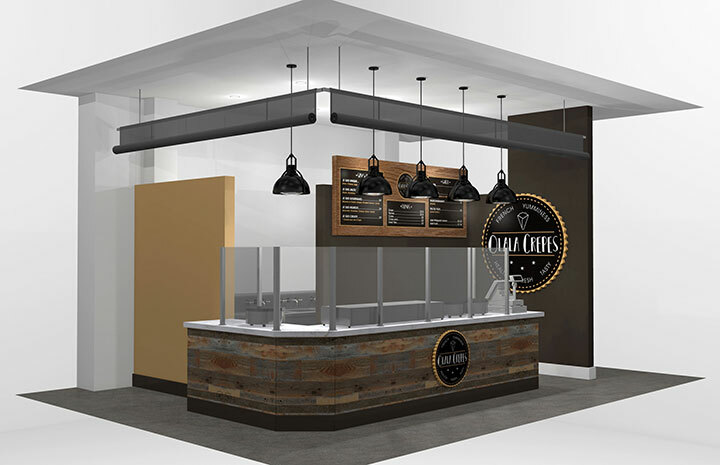 We designed the kiosk in the creative spirit of the crafty hipster style, with modern touches meant to keep the lines clean and the space breathing. Deciding on a neutral chromatic scheme, we introduced contrasting elements through darker finishes and a mix of materials. The wooden front side of the counter and the deep chocolate-colored background define the look of the shop. 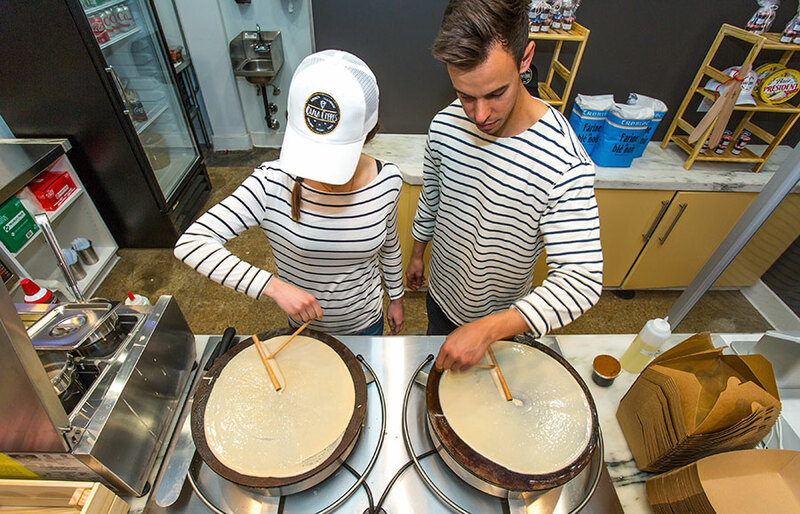 In terms of function, the long counters are used for displaying the process of cooking crepes in full view, while a divider wall allows the less spectacular side of the business to take place away from the eyes of the customers. An extra counter placed against this wall offers more working space – and more chances for us to use new tones of brown. 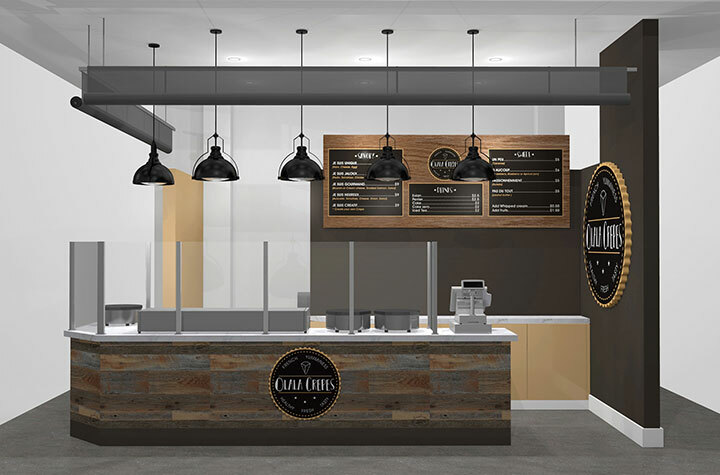 The different shades of the porcelain tile that looks like distressed wood in the front, with weathered touches that give the mix a certain kind of nobility, echo and tie in the colors of the kiosk: the brown tones of the kitchen enclosure, the lateral wall, the menu board. The row of pendants with an industrial look retain the calculated simplicity of the overall design while adding a bit of extra character. The choice of dark brown as the main color is related to the way customers tend to interpret it. Brown is an earthy color that evokes nature, coziness and warmth. It is friendly and non-intimidating, yet, when used in darker tones, it has a sophistication and majesty of its own. 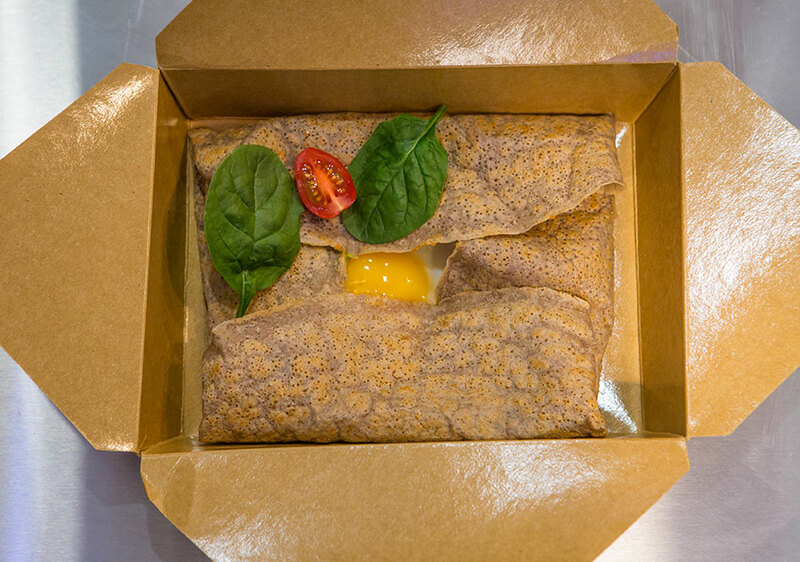 We wanted the Olala Crepes customers to feel comfortable and reassured, but also to be able to enjoy the richness of the color. We kept the same simple hipster style with dark and gold colors in the design of the Olala Crepes logo, which is fun, approachable and playful. 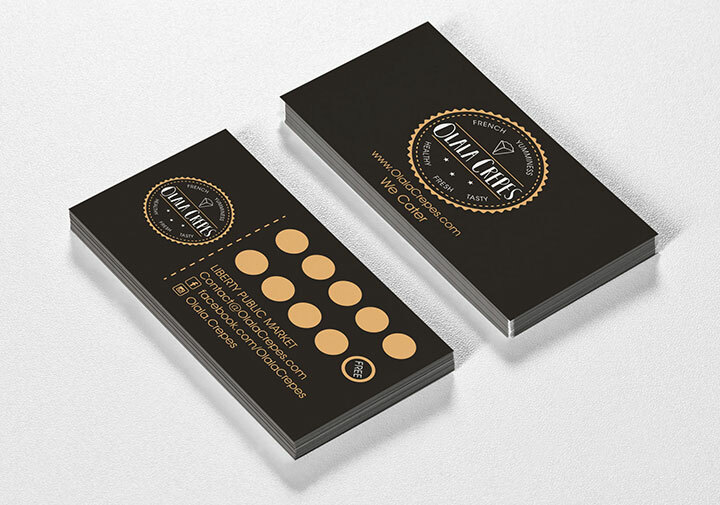 The Olala Crepes business and loyalty cards have the same clean, yet playful look. From the design of these small marketing tools to that of the kiosk itself, our purpose was to define the brand and create an inviting and highly functional space.